Sam was our first "American" golden.... the most loyal companion and friend, defender and playmate, protector and confidante. Our family has always had dogs ever since I can remember. When I was a little girl those treasured dogs consisted of mostly labs (yellow and black) but also over the years a shepherd, a pair of spaniels, and the odd shelter-rescue mixed breed - just about anything that has a wagging tail. However, one day many years ago, a friend of mine introduced me to their newly aquired golden retriever. He was a beautiful young boy, gentle and unassuming, absolutely handsome and sweeter than honey. I was hooked immediately - and luckily (so I found out) - this beautiful boy had a littermate that was still available! I didn't waste a moment in calling the breeder and then begged and pleaded with my husband to convince him to dig deep into our savings to pay for a new family member (It was a lot of money back then - but I was convinced that this boy would be worth every penny - and Sammy did indeed turn out to be priceless). We soon packed up the car and made the long drive to a small rural town, hours from where we lived, to pickup up our precious "Samson". Back before the internet, computers, and all the latest technology - we made the long trip sight unseen. He was there waiting for us - a wonderful dark-coloured boy with a beautiful face and a heart of gold. It was love at first sight - and consequently our love for the whole breed began. Sam was the first to come with us as a young pup to our "little piece of heaven on earth" - Maple Bay - where we now live. Back before we even cleared the land to build our home - he was the first one to explore the trails, hunt down raccoons, chase porcupines (what a crazy dog) and stand his ground against a passing moose. Sam loved the water and was never dry for long. He loved being anywhere the kids were - and I knew without a doubt they would always be safe when Sam was there with a watchful eye. He loved meeting and greeting all the families who came and went over the years at our cottages located on property - and loved the tasty morsels and leftovers everyone would sneak his way when we weren't looking! I think he probably enjoyed the Carpenters and their outdoor turkey roaster the most - although fireside marshmallows would be a close second - burnt or not. I know if Sam could speak he would say that his favourite morning outing was the short trek he made daily to Uncle Doug Moody's for a special dog treat .... and his favourite afternoon activity was hunting chipmunks. 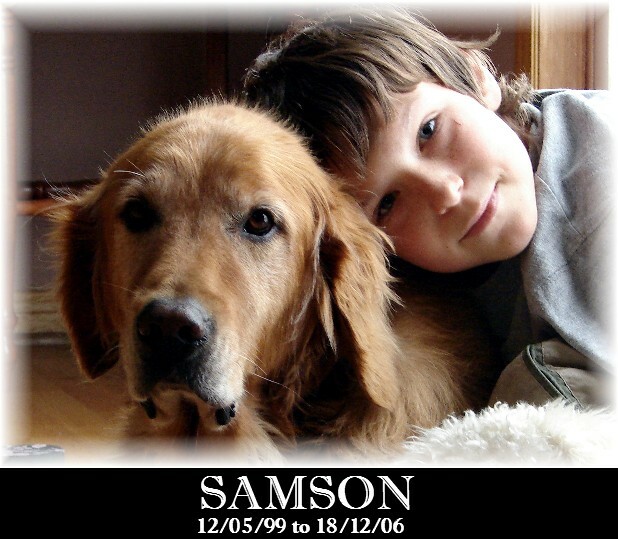 Sam was always a good listener and lovable boy - He loved it best when he was in your way - forcing you to bend down and pat his head or linger just a few minutes longer with him. Taken far too soon from us after a lengthy illness and a battle with cancer.... he will always be remembered as our hero. The adventures at Maple Bay will never be the same without him!